thus superficially resembling those of some of the less specialized extant carnivorans. There is no postorbital bar, so the orbital and temporal fossae are confluent, but a postorbital process exists in some forms. 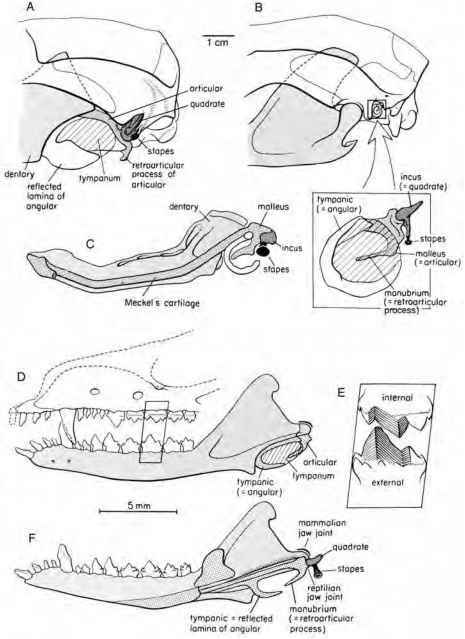 The infraorbital foramen was large, reflecting a large maxillary nerve that innervated a sensitive snout with tactile vibrissae. Chapter 11), suggesting a close relationship between these two clades. The oldest known pantolestan is the pantolestid Propalaeosinopa (Fig. 7.7A), first known from the early Paleocene of western North America (possibly late Puercan [Cifelli et al., 1995], but common by the Torrejonian). Pentacodon-tids were also well differentiated by Torrejonian time, indicating that Pantolesta must have originated very early in the Paleocene or perhaps before. Pantolestids are known from Paleocene to Oligocene strata of North America and Europe and have also been found in Asia and Africa. In unworn specimens, the molar cusps are moderately sharp; typically, heavy wear resulted in rounded or flattened cusps and exposure of dentine. This type of wear suggests a hard diet, such as mollusks or hard seeds, or perhaps the incidental ingestion of considerable grit. Dental morphology is consistent with omnivory The dentary has a high and broad coronoid process that is well excavated laterally, and a prominent, hooklike angular process, suggesting that all the jaw muscles were well developed (Matthew, 1909). The skulls of middle Eocene Pantolestes and Buxolestes had wide snouts, an elongate temporal region, and a prominent, broad lambdoid crest for attachment of neck muscles that supported and extended the head. Incomplete skeletal remains of Pantolestes from the middle Eocene of Wyoming have long been interpreted to indicate semiaquatic habits (Matthew, 1909). This conclusion was partly based on the humerus, which resembles that of otters in being short, robust, and slightly S-shaped in lateral profile, with prominent deltopectoral and supinator crests. 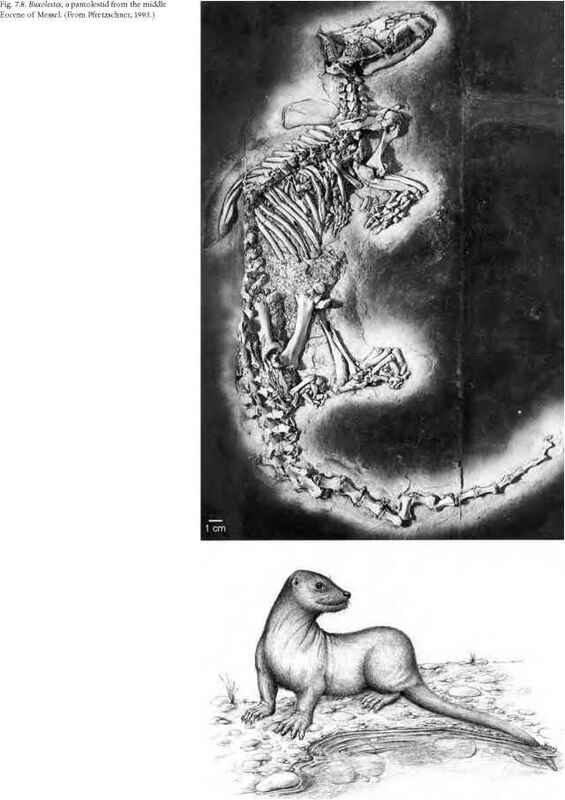 This interpretation has been corroborated by exceptional skeletons of middle Eocene Buxolestes from Messel, Germany, and late early Eocene Palaeosinopa from the Green River Formation of Wyoming (Fig. 7.8, Plate 2.1). They also have an otterlike humerus, as well as a long tail that is particularly robust proximally, as in otters (Lutra), which employ the tail for propulsion when swimming (Koenigswald, 1980, 1987; Pfretzschner, 1993; Rose and Koenigswald, 2005). The hind limbs were also well developed and probably assisted in swimming. The prominent, broad nuchal crest on the occipital region of the skull, and the large spinous process on the axis vertebra, reflect the presence of powerful neck muscles characteristic of aquatic mammals. The terminal phalanges are long, slightly curved, and somewhat broadened, reminiscent of those in the beaver Castor. Fish remains and other bones have been found in the stomach region of both Buxolestes and Palaeosinopa. Most of the skeletal characteristics of pantolestids are also quite similar to those of fossorial mammals, and it is probable that pan-tolestids were able diggers as well. Todralestes (Fig. 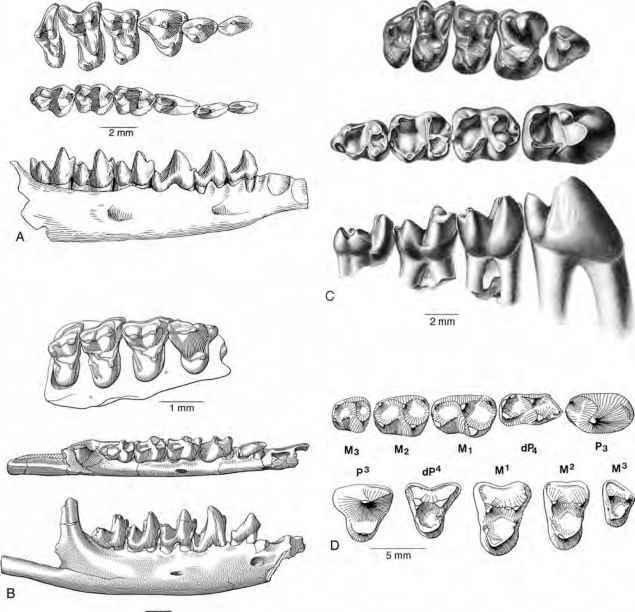 7.7B), represented by abundant dental remains from the late Paleocene Ouarzazate Basin in Morocco, appears to be closely related to pantolestids (Gheer-brant, 1994). It is variously placed in its own family, Todra-lestidae, or included in Pantolestidae. Todralestes was smaller than other pantolestans. Pentacodontidae (sometimes considered a subfamily of Pantolestidae) are distinguished by their unusual swollen fourth premolars, which are often much larger than the molars, and a tendency to wear the cheek teeth very heavily (Fig. 7.7C). The molars have relatively low, blunt cusps and a very narrow stylar shelf. In some forms they decrease in size posteriorly. The single known skull, belonging to late Paleocene Aphronorus, is similar in size and form to that of the hedgehog Erinaceus (Gingerich, Houde, and Krause, 1983). The auditory bulla is not preserved and apparently was not ossified. The teeth in this individual and some other pentacodontid specimens are so heavily worn that little remains of the original crown morphology, indicating a par ticularly durophagous diet, or one that incorporated much grit. Recently reported postcrania of Aphronorus—the first known for any pentacodontid—are robust and support a close relationship with pantolestids (Boyer and Bloch, 2003). All known pentacodontids come from western North America, mainly from Paleocene deposits, although one genus (Amaramnis) lived during the early Eocene. Evidence was recently reported that the pentacodontid Bisonalveus might have been venomous (Fox and Scott, 2005). If so, it is the oldest known poisonous mammal. The upper canine is deeply grooved on its anterior surface, comparable to the grooved lower second incisor of the venomous extant insectivoran Solenodon. In the latter, the groove helps direct venom from a modified submandibular gland to the prey. In Bisonalveus, some other specialized gland (possibly derived from the parotid) would have been involved. and Simons, 1987; Simons and Bown, 1995). When unworn, the crowns bear low, rounded to moderately sharp cusps arranged essentially as in pantolestids, although the upper molars lack hypocones. But the cusps quickly wore away, exposing wide areas of dentine, which suggests thin enamel, heavy use, or both. The premolars were robust, P3-4 being larger than the molars. The lower molars present a columnar appearance from the buccal side, and the trigonids are barely taller than the talonids. The molars decrease in size posteriorly. The single known skull of Ptolemaia appears to be generally similar to those of other pantolestans, but is too crushed to provide many details. Relationship to paroxy-claenids has been suggested, and many aspects of the dentition also resemble those of pentacodontids. Pantolesta were never abundant or very diverse, but they include some of the most successful semiaquatic mammals of the Early Tertiary. They were also among the first pla-centals to exploit the hard-object feeding niche. The latest known pantolestans disappeared in the Oligocene, leaving no descendants.